Out the old and in with the new. We’re all familiar with that saying. Things are no different in the eCommerce world. In order to introduce new products, you need to deal with stale, slow-moving inventory first and foremost. According to experts, inventory that’s sitting idle for more than six months is a major expense to your business. And, if your slow-moving stock happens to be a high-quality (and therefore high-cost) inventory too, it can add to your cash flow woes. So, how do you deal with your slow-moving stock that is not only obstructing the cash flow of your store, but stopping you from adding fresh stock into your business as well? I will walk you through six new ways that could help you deal with the excess inventory problem. But before I start talking about them, let me underline a few crucial facts about excess inventory and its severe effects on your eCommerce store. Holding on to stale and slow-moving inventory for longer than the required time will pinch your pockets. In other words, you will have to bear the opportunity cost, as you won’t be able to introduce any new inventory to the store, which means your money gets stuck in the process. The problem of excess inventory is common. You’re not alone. No matter how heavily you have researched the market or how accurate your sales forecast are, you’re likely to run into this issue at some stage. In eCommerce, as in life, things don’t always go as planned. So, keep your cool and try out these new strategies for selling your slow-moving inventory. 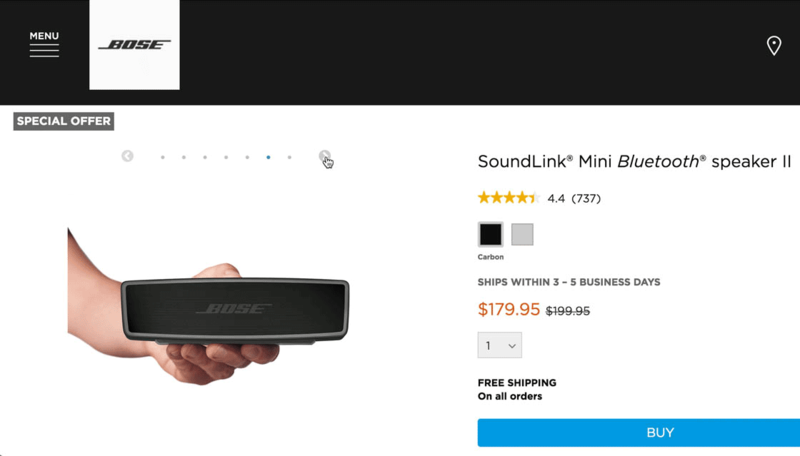 As it turns out, product images can make or break sales. This rationale applies to all sorts of inventory, including your stale, excess stock. So, when it comes to your product images, you could try uploading new images. It’s also helpful to showcase your products from different angles. It looks more professional and can help with conversions. For example, Nordstrom’s eCommerce store displays North Face backpack image from every possible angle. However, displaying high-quality images from different angles won’t always be enough to motivate shoppers to purchase your product. Why? Because if you look at the images closely, you’ll find that there’s one crucial image missing in the whole line-up. Yes. It's the *In-Scale* images. An in-scale image is crucial for selling products, stale or not, because it gives shoppers a more accurate picture of the product, especially in terms of size and scale. This is possible because the product gets directly displayed on a model (it could be a real or a computer-generated one) and not on the white background, as with the North Face backpack above. 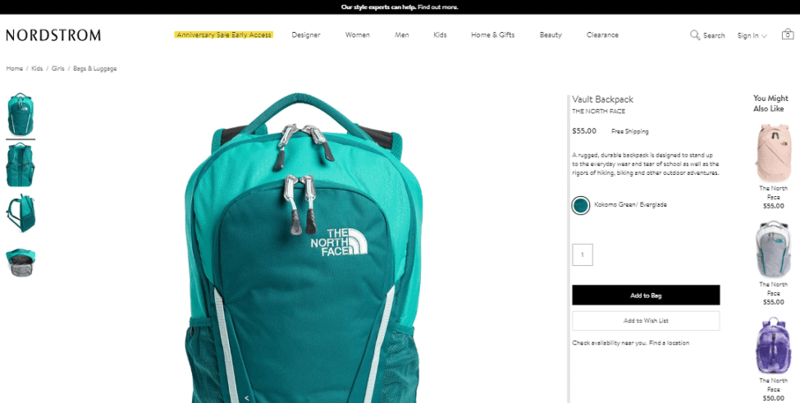 An image displayed directly on a white background (and not on a model) won’t help the shopper gauge the actual size of the backpack, thereby dimming its sale prospects. On, the other hand, the below picture shows the backpack worn by a model. According to Baymard Institute's research, this sort of in-scale images will give shoppers a proper sense of scale and thereby increases the chances of a sale. Okay! I can hear you! How about electronic items and other similar items that can’t be displayed on humans? How do you go about building in-scale images for the same? Here is an example which will give you a better idea. Say, for instance, you are selling a mini bluetooth speaker. 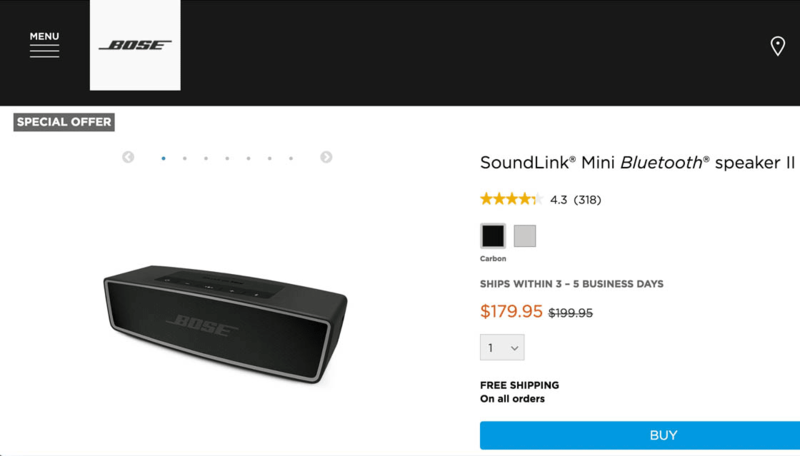 The above image wouldn't immediately give the shoppers an idea about the size of the speaker because there is no in-scale image shown here. This means the shopper has to go through the product description to figure out the actual size of the product. However, the in-scale image below will give the user a better idea of the size of the product. A good “In-Scale” image helps shoppers easily grasp the features right away without having to depend on the product description or specs. Punchline: This strategy may not lead to sales of all your stale stock, but then, an addition of in-scale images are sure to motivate customers to take a second look at the products, which they might normally pass up. It is a common thing, these days, to price your products with *.99* at the end. This is referred to as left-digit pricing. It is commonly used because people tend to read prices from left to right and having 99 digits at the end makes a product seem cheaper than it really is. For instance, when shoppers see an item is priced at $1.99, they’re more likely to see it as being closer to $1 than $2 at first glance. However, the best part about this pricing strategy is that it works on some people, at least, some of the time. That’s a good enough reason for this pricing strategy to enjoy widespread popularity. Punchline: Don’t just try the .99 thing. Also, try using 99 before the decimals. So, instead of saying $100, you could price your slow-moving goods as $99. Got the drift? The best way to sell an item is to place it right next to a premium item. This is referred to as “anchoring” in psychological terms. A study published by The Wall Street Journal talks about a retail company Williams-Sonoma that leveraged the anchoring technique to sell its slow-moving $275 bread maker. For this, the company introduced a similar, but marginally better, bread maker for $429 and placed it right next to $275 bread maker in a print ad. Interestingly, the sales of the $275 bread maker skyrocketed. Anchoring makes you rely on the first piece of information offered while making decisions. In the case of the bread maker, you see the higher priced machine first, and in the next moment, you see a machine that is available at almost half the cost. The anchoring makes you believe that you’re getting a great deal and you should go for it, no matter what. Punchline: Keep comparison pricing in mind while putting a price tag on your products. Try placing a “premium” version alongside the normal version and see whether it helps. Be assured, bargain hunters will almost always go for the less expensive option. Yes, you can even use your email captures to shed that extra stock. Check out the example below. 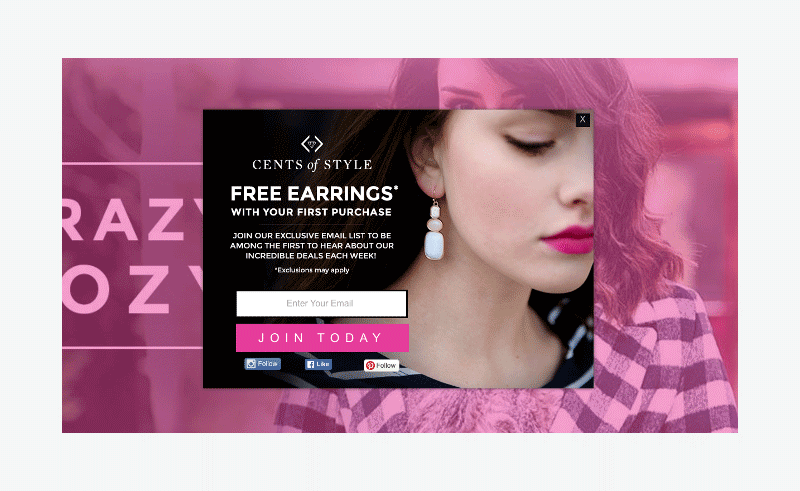 You can say something similar in your email capture pop-ups: Subscribe to our monthly newsletter and get dazzling pair of alloy earrings, completely free. I am sure, both women and men, eager to please their wives and girlfriends, would be eagerly submitting their emails. While it means parting with stock for “free”, having more email addresses in your list means more leads and customers later. Punchline: Twin benefits of email capture pop-ups: One, you get to build your email list. Two, you get to flush out slow-moving, excess inventory. FOMO or Fear of Missing Out is one of the most effective sales strategies for pushing the sales of your slow-moving products. Let’s take a look at Amazon’s Fomo Marketing example. 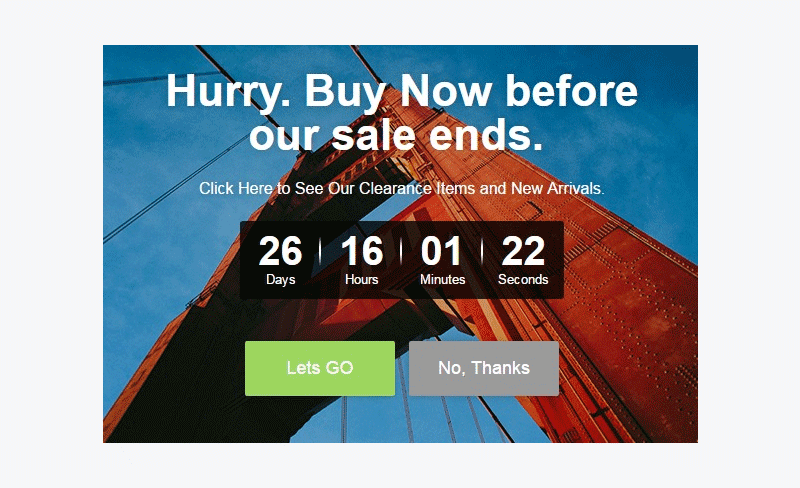 The above image convinces shoppers that time is running out and they need to act immediately in order to secure the massive discount. There’s literally a clock counting down the time before their eyes. You could even tap into buyers Fomo by offering a discount on different things on different days, and especially on occasions like Christmas and more. Check out how livingchiconthecheap.com leverages Fomo technique to build traction for its site. Or by coming up with a countdown popup for your stale inventory. Punchline: The current generation is all about instant gratification and immediate payoffs. Fomo strategies for your excess inventory should hinge around these two human emotions, which, in turn, will help you sell more and more. You cannot run away from the excess inventory problem. No matter what, you will have to deal with it every 3-6 months. And the best way to handle this problem is to set up a different section on your website for the sale of excess inventory, all year around. So whenever you feel like making way for fresh stuff, you could simply shift the old inventory to the clearance sale section of your site. What’s more, you could even use an eCommerce app to announce clearance sales of your stale inventory to your subscribers. If you still haven’t developed an app for your eCommerce business, and wish to launch one, check out this survey, first and foremost, to gain a basic idea as to what shoppers expect from an eCommerce app. Punchline: You can use a separate section on your website to announce clearance sales to move excess stock. Be assured, bargain hunters will keep tracking this page. Go ahead and try these new strategies with your slow-moving stock. You can even combine several strategies at once to help improve sales. As an eCommerce business owner, you don’t want to get stuck carrying excess stock so you should be trying everything you can to get it out the door. These strategies will help you do just that. Have you been using any other out-of-the-box strategies to put your slow-moving-products in quick motion? We’d be happy to hear about them in the comment section. 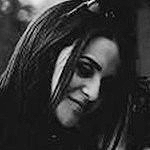 I’m Jennifer Warren, resident wordsmith with GoodFirms – a review and research platform for top ecommerce development companies, digital marketing companies, app development companies among many others. I enjoy humanizing technology through inspirational content, devouring best sellers, watching war movies, and running behind my sunshine sons. Online sellers are moving PS4 video games like hotcakes. Are you one of them?